St. Athanasius, Bishop and Doctor - Memorial - My Catholic Life! The First Sunday of Advent of 2011 introduced to the faithful a new liturgical translation of the Mass in many English-speaking countries. The new translation had been many years in the making and had gone through numerous drafts and revisions. Of the many noticeable changes, some of the most extensive were made to the Nicene Creed. The phrase “one in being with the Father” was changed to “consubstantial with the Father.” This caused confusion and discomfort for some, as “consubstantial” was not a familiar English word and sounded more appropriate to the realm of mathematics. But “consubstantial” had a long historical and theological pedigree supporting it. Its noticeable use in the newly translated Creed, and the curiosity it provoked, was also a distant homage to today’s saint, Athanasius. He fought for, and suffered for, this one word. To say that Christ is “consubstantial” with the Father is to say that He is not one in person, one in mind, or one in will with the Father. He is distinct from the Father in His personhood, His mind, and His will. But Christ is entirely united to the Father in His substance, or nature. That is, Christ is God from God in the same way that light is from light or, to use the probable original analogy from that pre-electrified era, Christ is God from God and flame from flame. A wick carries a new flame away from its source, to burn the same or hotter somewhere else, without diminishing its “parent” fire. One source, two flames, generating heat and light in different places for different people. Christ did not become God sometime after He was born of the Virgin Mary. He did not develop into God as a teenager. Nor was He bestowed with divine powers in some pivotal event. He was a baby God, a teen God, and an adult God because He was always God. Nor was His God nature a mere cloak under which was hidden a human self. Jesus Christ was fully human, of course, but also fully divine, and these two natures were united in one complex person. Most of the Church’s finer Christological definitions were destined to be clarified at later Councils. The first two Councils, Nicea (325 A.D) and Constantinople (381 A.D.) were concerned with understanding and defining the Trinity first. Once Trinitarian definitions were worked out, later fifth-century Councils would address more fully the nature of Christ Himself. Before delving into what Christ was for, or what He did, it was necessary to establish who He was. His being preceded His doing. Saint Athanasius’ theological contributions to defining, for ever and all time, the metaphysical significance of the Incarnation is now taken for granted. But without this correct understanding, Christmas would be just a historic anniversary of an important birth, like that of Julius Caesar or other greats of history. But Christmas is Christmas because Christ was God from the start. Theology is not just a pillow on which the Church rests, of course, so the theology of the Trinity and of Christ has been greatly enriched since the Patristic age, most notably by an emphasis on the Cross as the fullness of the self-emptying that began with the Incarnation. Saint Athanasius was without equal in defining and defending the Church’s dogma on the true nature of the Trinity. And for that immeasurable contribution he is owed an immense debt of gratitude by all the Church. 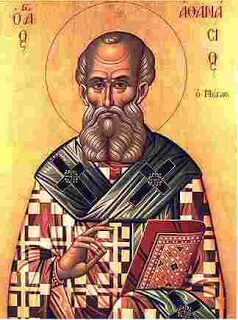 Saint Athanasius, your courage and perseverance in combating false teaching cost you comfort and security. May your example and intercession assist all teachers to understand the importance of truth as the starting point for reflecting more fruitfully on the mysteries of our Faith.